One bedroom free standing cottage,sleep 2 adults, views from every window, private location for romantic getaway. get up close with the alpacas to take photos and to feed. Located in picturesque rural setting at the gateway to the beautiful Yarra Valley, off the main Highway with no thru traffic. Wineries, Restaurants and places of interest within 5 minutes of Raynella, without travelling on busy Highway. Warburton Trail, Craft Markets, Day on the Green Concerts, just plain R & R. Wineries close by are: Helens Hill, Tokar Winery, Medhurst Wines, Coldstream Hills, Warramate, Killara Estate, Wild Cattle Creek, Rochford Winery, Coldstream Brewery, Global Hot Air Ballooning, Coldstream Airfield, Wandin Park. Raynella does not take group bookings. The only thing we didn't like was that we couldn't stay longer. We stayed here the night before Oxfam 100km walk and were so disappointed we couldn't stay longer! 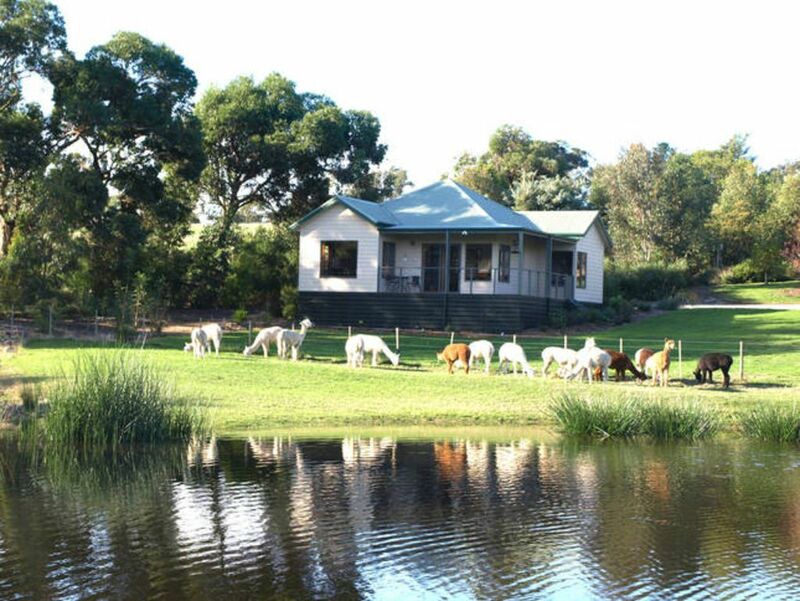 The alpacas were just gorgeous and the accommodation was just perfect! We'll be back for a longer stay next time. didnt have any electricity when we arrived due to a storm but Nell and Ray were running around arranging water and making sure we were ok for a meal that night. Thanks for the positive feedback much appreciated. Highly recommended. We stayed here to go to "A day on the Green" and Ray even drove us there and picked us up at the end of the night! Delicious home baked bread and breakfast provisions and very comfortable bed. We'll be back! Thanks Guys its always great to get positive feedback. Had a lovely feel we will definitely be back!! The property is beautiful and serene. The perfect location for some R&R. The accommodation comes with a tasty country breakfast hamper and (the most amazing) bread. Meeting and feeding the alpacas is definitely an experience to remember and we had to visit them a couple of times during our stay because they were just so adorable. Also got to explore the surrounding areas and found there's plenty of places to discover along with an amazing range of wineries. I would 11/10 recommend this place to anyone who is looking for a place to unwind and escape. Thanks Nell for a wonderful experience! Always a delight to return to Raynella where we feel it is a second home. Lovely views with fantastic hosts in Nell and Ray. Cottage is always neat and tidy with all the facilities you require. A great place to unwind from the stress of working life!